This is Petko Genkov. 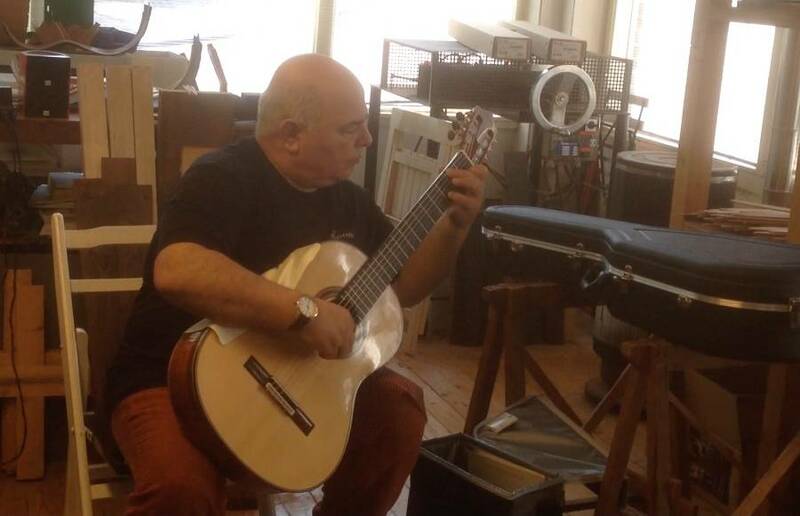 He is a Bulgarian guitarist living in Dubai where he started his own music school. Last July he came to Amsterdam to pick up his guitar and in August he sent me his opinion about it. I am playing several hours a day and I started to sense its values. Being a great fan of the Savarez strings I changed the strings with Savarez and the result is great. After the change of the strings the volume went a bit high which is excellent. The guitar sounds alluring and lyrical. In the first days I started to play, the sound was a bit up. But now it is deeper and deeper. The strings separation is very clear. Few of my colleagues had the opportunity to listen to the guitar and they are very content with the result. Moreover I had the chance to listen to the guitar from the point of a listener. The vibrato is very clear and sounds very poetic in the high frets. The basses are very deep. The combination between the discants and the basses is wonderful. I am sure that much of the development of the instrument is coming up. The fingerboard is very comfortable like Rolls Royce!! In the end I want to say that the physical beauty of the guitar is extraordinary. As a Netherlands girl I named her Suscia. After the end of August the instrument will become an Arab princess! !